BERLIN, GERMANY – 18th March 2019 -- innogy Innovation Hub, which is funded by innogy SE, a leading Germany energy company, to invest in and mentor technology start-ups, invested in 61 companies in 2018 through new and follow-on financing rounds, growing the value of its portfolio by more than 50%. 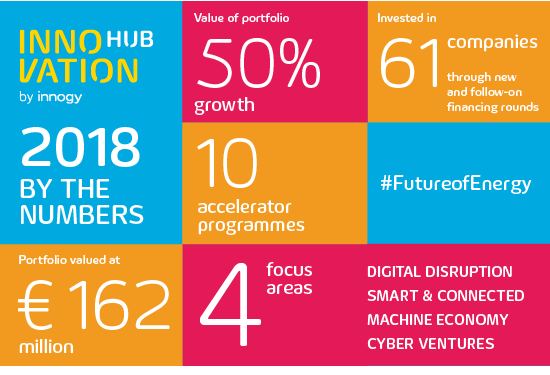 Including co-investments and investments into other VC funds, the Innovation Hub has funded almost 90 start-ups. “We’re very proud of what we have built so far. Our hybrid approach combines traditional corporate VC with accelerator and angel investing, giving us unparalleled access to the most promising start-ups and presenting unique value and innovation creation opportunities. In a short space of time, we’ve built a team, culture and organisation that drives exponential growth rather than incremental change. We’re looking forward to developing this approach as we continue to invest in the companies that will help build the future of energy.”, said Thomas Birr, SVP Innovation and Business Transformation innogy SE and CEO of innogy Innovation Hub.